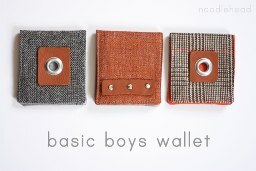 Anna from Noodlehead joins Celebrate the Boy with a tutorial showing how to make her Basic Boys Wallet. The suiting makes such awesome wallets! And with grommets and brads and scrap leather, they’re anything but “basic”. They open up to reveal a large pocket for folded money and 4 smaller pockets for credit cards. Get the tutorial.